Raith claimed a 3-0 Scottish Cup win over Queen's Park at Hampden. The importance of Raith Rovers' Scottish Cup victory at Hampden became apparent an hour after full-time when the draw for the fourth round was made. An eagerly-anticipated Fife derby against Dunfermline Athletic to played over the weekend of January 19/20 was the perfect reward for a comprehensive 3-0 win over Queen's Park. Not only will the game attract a bumper crowd to Stark's Park, bringing a much-needed financial boost, it also presents a tough, but not unrealistic path to the fifth round of the competition against a Pars side who have been struggling in the Championship of late. The news of the draw came as Rovers were still savouring a powerful attacking performance at the national stadium, and a first clean sheet since the return of John McGlynn. But while the outcome was convincing, there game was not without its uncomfortable moments against a Queen's side who certainly had a go, and who could have made things more awkward had they made the most of some errors at the back. Going forward was where Raith excelled with pacy wingers Daniel Armstrong and Nathan Flanagan making the most of the wide open spaces at Hampden to play a major influence in terms of creating, and in Flanagan's case, scoring chances. Those two were unplayable at times, while the movement and link-up play of Kevin Nisbet and Liam Buchanan also caused problems for the part-timers, with both strikers helping themselves to a thoroughly deserved goal apiece. Rovers made two changes from the side that claimed a 3-1 win at Stenhousemuir the previous week. Grant Gillespie made a welcome return to the starting line-up from a nine-week injury lay-off but was moved from his usual midfield berth to right back, a position he is not completely unfamiliar with having played some of his career there in the past. It meant Jamie Watson dropped to the bench as McGlynn opted for experience and while Gillespie looked a little rusty at times - understandable in his first game since mid-September - he will have benefited greatly from getting 75 minutes in the tank. The only other chance saw Nat Wedderburn return from suspension in the middle of the park, with Callum Crane dropping out through injury. Rovers game plan became apparent in the early stages, using the full width of the pitch with goalkeeper Robbie Thomson looking to play it out from the back at every opportunity, drawing Queen's out of their defensive shape. At times Rovers played themselves into trouble, with Ross Matthews dispossessed 30 yards from goal, which allowed Euan East to drive into the box before sending a cross-come-shot which looped over Thomson and skidded off the face of the crossbar. After that 11th minute let-off, Raith took the lead two minutes later with a clinical move started and finished by Nisbet. The striker's crossfield pass set Armstrong free down the right and the winger zipped past his man with ease before drilling the ball across goal for Nisbet to heel-flick into the back of the net from six yards - an eye-catching finish for his 18th of the campaign. Queen's reaction was a positive one and indecisive defending allowed Lewis Hawke a free header from six yards which should have resulted in an equaliser, but the striker sent his effort over the bar. Raith were leading but they did not look entirely comfortable until they scored a second goal against the run of play on 23 minutes. This time Matthews popped up in the right wing position to send a low ball across goal that was touched into the far corner by Buchanan. 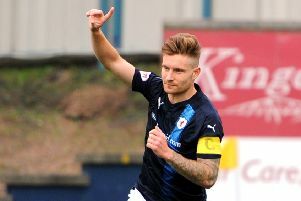 Two attacks, two goals and Raith had delivered a lesson in clinical forward play. The Fifers now had their tails up and the football was free-flowing with Armstrong sending a deep cross to the back post where Nisbet peeled off his man and sent a header back across goal, only to see it bounce off the post. Rovers were now bossing the game and but Queen's stuck to their task and almost pulled one back before half-time when Kieran Moore's goal-bound header cannoned off Kyle Benedictus before East drilled a low angled effort which Thomson did well to hold. During the interval, there would have no suggestion in the away dressing room that the game was dead and buried, and the Spiders' positive start to the second half suggested a third goal was required to kill off the tie. Nisbet should have provided it on 55 minutes but allowed the ball to roll under his foot in front of a gaping net after great work from Euan Murray down the left. However, two minutes later Flanagan produced the killer touch with a driving run through the heart of the Queen's defence, showing great poise and composure before picking his spot past Jordan Hart for his third goal of the season. The game was now over as a contest but there was still a clean sheet to earn, with the crossbar coming to Rovers' rescue on 67 minutes as a long-range effort from Scott McLean cannoned down off the underside of the bar with Thomson beaten. The Raith 'keeper also had to make a low one-handed stop to his left after home substitute Adam Martin who had got the better of Gillespie to break free into the box. At the other end, Raith were playing some sharp, incisive attacking football and could have added further goals but Nisbet blasted over the bar with just the 'keeper to beat, while Gillespie saw an effort cleared off the line. Another long-term injury returnee, Chris Duggan, got the final 10 minutes off the bench to complete a satisfactory afternoon for the Kirkcaldy side. Now bring on the Pars.